Rick Scott, The Great Gazzoon. Grand Poobah Music, 2012. "Your story can't be told without music"
This is story telling at its very best, with music and sound effects used to great effect. 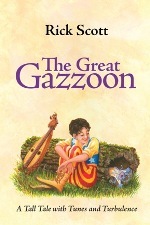 "The Great Gazzoon" is a fairytale story set in a remote kingdom near the peaks of Mount Lanadoon. It's a tale of a boy who wants to play his music, while he should really practise walking the dangerous wires between the two towering peaks of the mountain. And this is in a setting with angry (and talking!) winds, mischievous echos - and of course a princess and a king have to play a part as well. Written by Canadian storyteller/singer/songwriter/dulcimer player Rick Scott together with Valley Hennell, this epic story - over 3 CDs and 4 hours! - is presented in an entertaining and captivating way, with clever use of words, music, poems and sound effects. This is a story which young (suggested from age 8 - so I will get the CDs out again when my girls are older!) and old will enjoy and will wish to listen right to the end of the 4 hours. 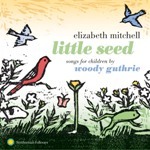 Elizabeth Mitchell, Little Seeds - Songs for Children by Woody Guthrie. Smithsonion Folkways, 2012. Additionally to the 3 story telling CDs, there is a fourth CD featuring full length versions of all songs and music from the other three CDs. While I do like the idea, I am not convinced about this CD - the songs are great as part of the story, for me they do not work as a collection of standalone pieces. The 4-CD collection comes in a beautifully designed 4-CD card board package, with an attractive 40 page booklet of songs and poems. Cilla and Artie to Hang Up Their Kettle! Cilla Fisher and Artie Trezise, the stars of children's entertainment group 'The Singing Kettle' have announced they are to retire in the New Year.The husband and wife team who founded the group in 1982, are to hang up their kettle more than 30 years after they began performing. The album "Little Seed" sees American folk singer Elizabeth Mitchell embarking on a project performing songs written by America's folk hero Woody Guthrie for his children. I have to admit, I have been disappointed by this album. Not knowing the original versions, while I quite like the lyrics, I feel that the interpretation of the songs on this album lacks the feel of childrens songs - it lacks the energy, the wit, the fun. All songs sound quite serious, thoughtful, grown-up - somewhat as if the attempt was to make these childrens songs more appealing to grown-ups. It's just under 30 mins worth of good quality American folk - but certainly my children found the album a bit dull, and I can see where they are coming from! I have finished this column a few times by writing about one of the plethora of lullaby CD samplers on the market - obviously this is a big market. And this is one of those CDs where I wonder - did we really need this one? 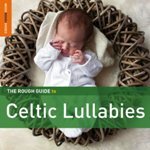 The Rough Guide to Celtic Lullabies. World Music Network, 2012. The Rough Guide to Celtic Lullabies features a number of excellent songs and tunes of top Celtic artists - such as Altan, Flook, Liz Carroll. They appear next to, certainly in comparison and to my taste, more mediocre numbers from lesser known artists - some bordering on the esoteric side - such as Margo Butler or Golden Bough. So as a result, I did not feel that the CD has a red thread, and it has too many numbers that I do not like. But there is a silver lining to all of this - and that is the bonus CD included with the sampler: 36 minutes of beautiful, calming, quality harp music of Irish traditional tunes, played in by Grainne Hambly. Photo Credits: (1)-(3) CD Covers, (4) The Singing Kettle (from website).